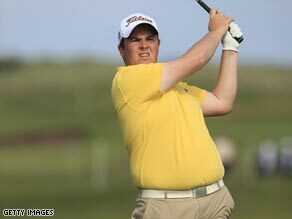 (CNN) -- Irish amateur Shane Lowry continues to handle the conditions better than his professional rivals, as he goes into the final round of his home-town Irish Open at County Louth with a share of the lead. Local amateur Lowry continues to show the professionals how to handle the County Louth links course. On Friday, Lowry's stunning 62 meant Lowry became only the second amateur to lead a European Tour event at the halfway stage and he maintained that form despite being forced off the course for over five hours having played just one hole in awful, windy conditions. Lowry, 22, carded a one-under-par 71 to post a 54-hole total of 200 (-16) to lie level with England's Richard Rock -- and would have led by two strokes but for the final hole, which Lowry bogeyed and Rock birdied. Lowry told reporters afterwards: "That was a bad bogey on the last -- I should not really have been going anywhere near the flag with my third, but I'm still happy enough. "A 71 was respectable enough and I'm still in the lead, so I can't ask for any more. But I knew he was going to hole that last putt." "I was a bit nervy coming up the last, if you're not nervous you can't be human. If I play the same I have all week I'll have a good chance." Rock, still in search of his maiden Tour win, and Lowry are two in front of Swede Johan Edfors, whose 68 was the round of the day. A further four strokes behind are Scotland's Alastair Forsyth, England's Nick Dougherty and Frenchman Thomas Levet, with Colin Montgomerie another shot further back. Meanwhile, course record holder Graeme McDowell was forced out with an injury. The Ryder Cup star, who had recovered from an opening 77 with an incredible 11-under-par 61 on Friday, was forced out with shin splints in his right leg.